“Most movies about artists tiptoe reverentially around the art and focus instead on the tortured life. Rodin is very much about the work: Not since Jacques Rivette's magnificent La Belle Noiseuse (1991) has a film zeroed in on creative process with the same obsessive care it devotes to the artist's volatile love life. 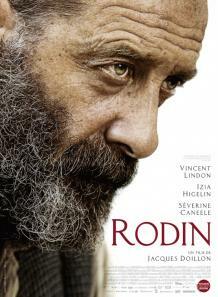 “Less a narrative than a collection of evocative scenes, the film gives us Rodin as a monomaniac without boundaries and an un-self-consciously untutored innovator with form. We see him bond with other misunderstood artists like Claude Monet and Paul Cezanne. But though he's his own kind of Impressionist, working in remembered snapshots of the human form, Rodin is far from hostile to realist representation. He insists on the dynamic primacy of the body as an expression of feeling and character.